Nokia is launching a free music streaming service for Lumia handsets in the US. Dubbed Nokia Music, the service was originally launched across Europe a few months ago, and includes access to 150 curated playlists as well as a Pandora-like feature that lets you create a playlist based on a particular artist, song, or music category. Nokia Music is ad-free and does not require any registration or subscription. And while it does not allow on-demand access to select individual tracks, users will be able to download playlists and stations for offline listening for those times when a data connection isn’t available. While the free streaming service will be enough for some people Nokia is not missing the opportunity to promote its other music services. Namely, users will be able to link straight through from what’s currently playing in Mix Radio to buy and download that track from Nokia’s own MP3 store, which currently offers more than 15 million tunes. There’s also a “gig finder” feature that uses location data to display information on nearby concerts and events related to users' musical interests, with the option to purchase tickets right from the Nokia Music app. 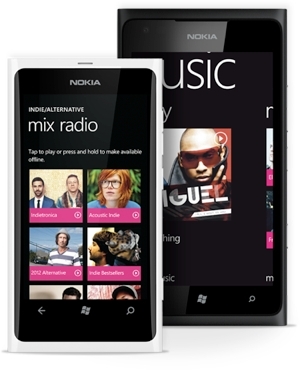 Nokia Music will be freely available in the US starting today from the Nokia Marketplace for owners of the Lumia 900 and 710 handsets. The free service should help Nokia lure more users to its new smartphone devices. More announcements from the Finish firm are expected tomorrow at a press event in New York City, where it is widely expected to debut handsets designed to run Microsoft’s Windows Phone 8.